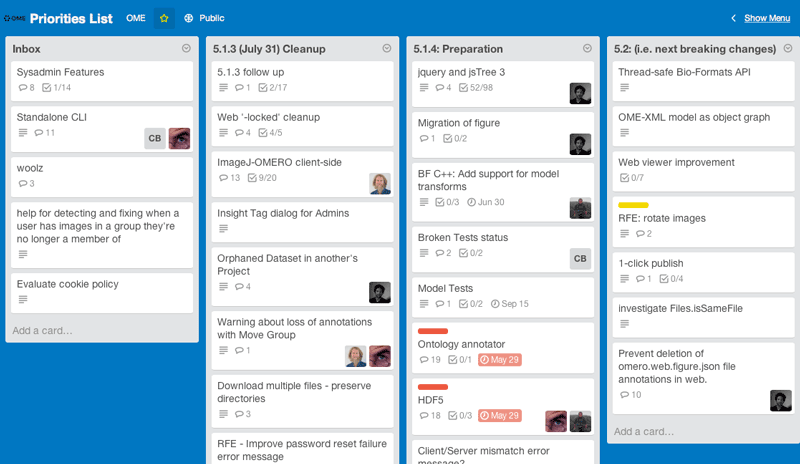 The OME team uses a Kanban-based approach to manage development work. New features, or bug fixes which require significant amounts of work, are identified as priorities, listed in the ‘Priorities List’ board on Trello and then assigned to a target release. As the particular release becomes imminent, cards assigned to it are moved to a dedicated release board to allow all the current work to be tracked in one place. ‘Epic’ bodies of work may be managed via topic-based boards. Developers should focus on the tasks identified as priorities for the next point release or longer-term work towards the next major version based on the outcome of team meetings. Constant communication is vital to ensure everyone is working together to the same goals. 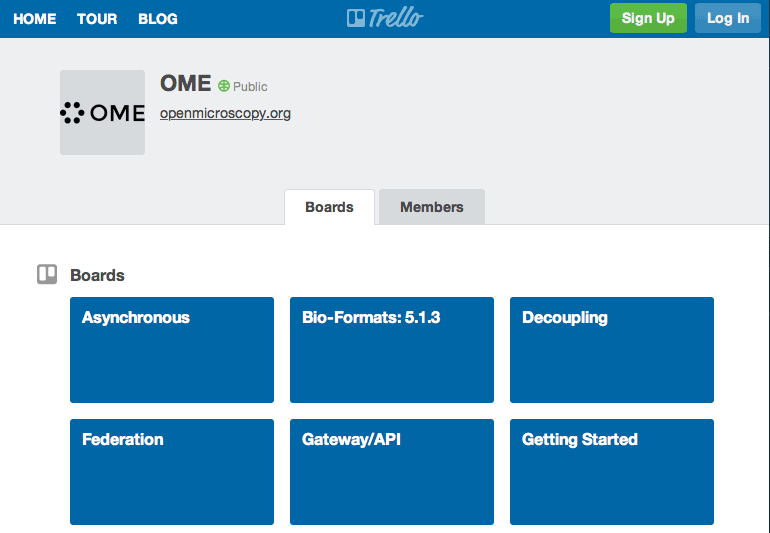 To follow the development process from outside the project, you can view the milestones on the Trac Roadmap page and Trac tickets for bugs and/or follow our new public Trello OME organization. Trello is now used for higher level planning and will be of most interest to those concerned with new features and functionality (Trac is still used for individual bug tracking). The ‘Getting Started’ board provides full instructions and an index of current boards, allowing you to browse upcoming work for the next releases and topic-based ‘epic’ work plans. You can sign up for a free Trello account to add comments and you need to be added to the organization (by commenting on the ‘Add me, please’ card) to gain extra permissions e.g. to vote on or add cards. For information about keeping up to date with OME projects, refer to the Team communication guide.